I would like to launch an official complaint regarding the BC Securities Commission and numerous conflicts of interest that it is entangled in. These issues are serious issues that effect all Canadians and investors globally. I will start with the primary complaint however there are several levels of conflict of interest that exist at the BC Securities Commission. 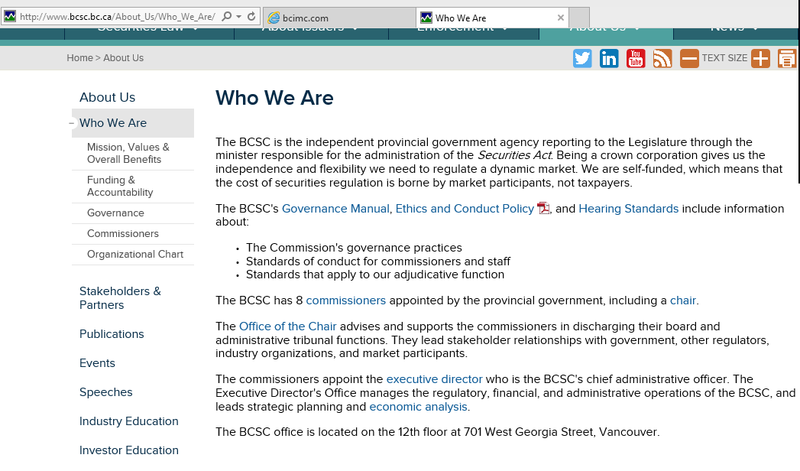 Taken as a one off they may not be so concerning however when the larger picture emerges it is clear the BC Securities Commission operates in such a conflict of interest that it has compromised both its purpose and its legal integrity. Conflict of Interest #1 – BC Securities Commission Owns Securities in BC Investment Management Corporation. The BC Securities Commission cannot properly do its job and ensure a fair marketplace, it cannot hold Tribunals and render any meaningful judgments when it itself may stand to gain financially from deciding one way or another when judging a financial securities case. 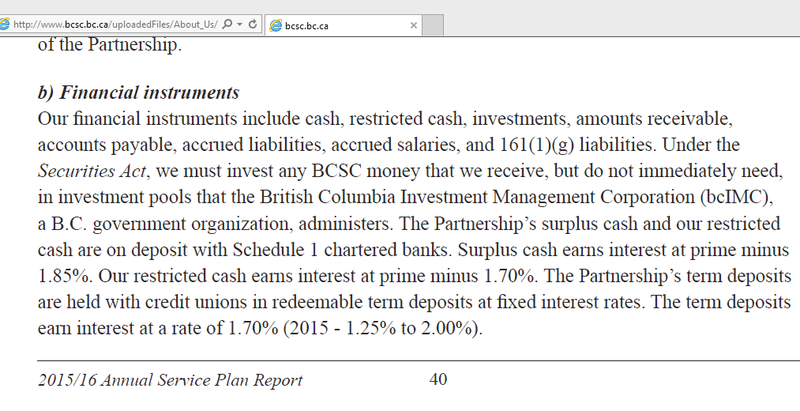 Here is the evidence regarding the holdings of the BC Securities Commission in BCIMC. The source can be seen here at the BCSC website. More on the BCSC and its BCIMC Holdings Below. The BC Investment Management Corporation holds hundreds of financial securities, many companies which may be and/or are in direct competition with other public and private companies operating in BC and Canada owned by Canadians, British Columbians and the rest of the shareholding public around the world. These investors all expect to invest in a sound market where the rule of law is prevalent and the financial securities regulator operate as free from conflict of interest as possible. 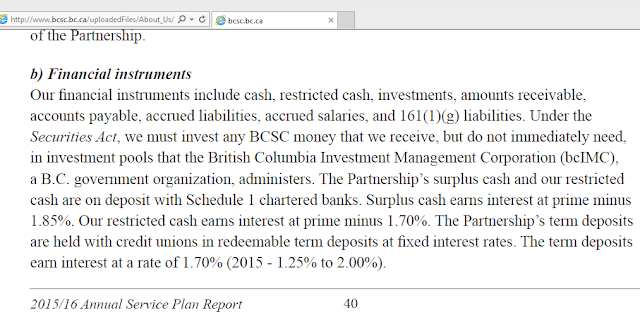 The BCSC may claim that it does not directly own any public and/or private equities in the securities markets, it simply owns commercial paper through BCIMC however this is still a clear cut conflict of interest. How can the BCIMC and any of its potential holdings not get preferable treatment from the BCSC when the BCIMC controls the pension funds of the BC Securities Commission?! Here is the link to the list of holding of the BCIMC. How can the BC Securities Commission make any rulings in the financial sector that are not in some way compromised by the holdings of the BCIMC? Conflict of Interest #2 – The BC Securities Commission is Self Funded and Compromised Due to Its Inherent Need to Fund Itself. 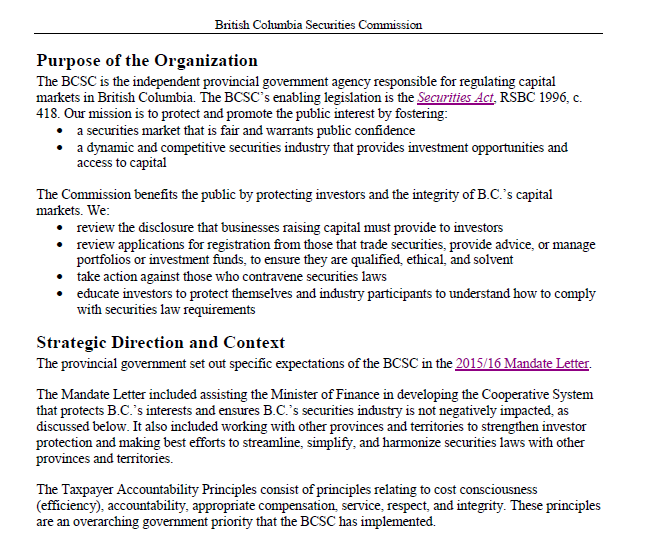 The BC Securities Commission exists as a corporation that is self funded. It is the financial regulator for the securities markets in BC and must maintain the integrity of the markets and assure a fair and dynamic marketplace. It cannot do so when it exists by creating rules and regulations which must be broken in order for it to create revenue for itself. See below on how the BCSC is funded. Since the BCSC is self funded would it be more inclined to skip due process and adherence to the rule of law when making a case? We certainly think so given this email below. Keep in mind although the BCSC claims the right to operate as it sees fit it must still adhere to the rule of law and the fundamentals of justice. There is no protection under Section 170 or any other part of the Securities Act that allows the BCSC remedy for its actions. This has been demonstrated here. How can the BC Securities Commission be trusted to act in a fair and unbiased manner when making any legal rulings if its very financial well-being may depend on it ruling in a manner that favours itself over justice? These are just a couple examples of the BC Securities Commission and its complete disregard for the rule of law and justice, I will not at this time cover the full extent of the crimes of the BCSC. 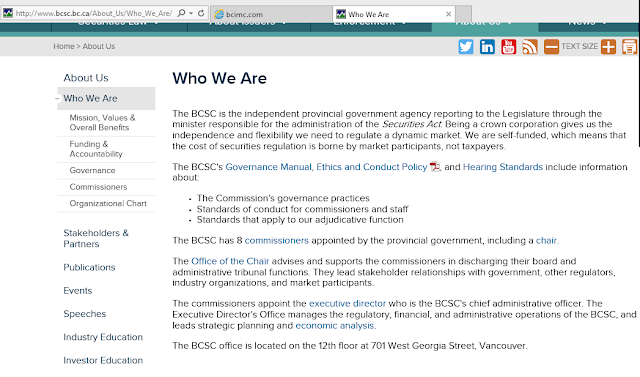 The purpose of this complaint is to outline the conflicts of interest at the BCSC that encourages and perpetuates the ongoing criminal activities of the BC Securities Commission. Again this is unbelievable. How this is not a considered a conflict of interest is very puzzling and concerning. Hold on for this one.. So a financial regulator (the BCSC) that is actually a corporation that owns ‘securities’ in another corporation (the BCIMC) that owns investments inside the jurisdiction that the financial regulator is tasked with regulating. This financial regulator also happens to have to fund itself and police itself while supposedly maintaining a fair marketplace. When one has a complaint about the actions of the BCSC staff which is often criminal that complaint is submitted to the BCSC who somehow always find that no wrong has been done despite all evidence to the contrary. Did the mob think this racket up? How Conflicts of Interest Compromise the Mandate of the BC Securities Commission. The supposed mandate of the BCSC and the reality of how it actually operates are two complete different things. The previously mentioned conflicts of interest are not the only ones at the BCSC, the issues facing our thoroughly corrupted financial regulators are vast and complex. Many of the underlying issues however stem from the fact that these conflicts of interest exist, the BCSC operates in the manner of an extortion racket. It uses its supposed powers and the fact that it is an SRO that is also self funded to extort the people of BC with its often compromised judgments in its sham of a Tribunal process. These conflicts of interest have encouraged the BCSC to completely throw out the rule of law. The following are a couple of links containing evidence that furthers these claims. Would conflicts of interest encourage BCSC employees to lie in order to make a case? Why would the BCSC refuse a Settlement offer that could have protected shareholders of a BC company from losing their investments? Why would the BCSC try to hide this case from the public? The BCSC is deceptive and operates in a criminal manner, the conflicts of interest that surround it play a large part in this racket. To much of the public the mandate of the financial regulator for the province of BC is seemingly straight forward and understandable, at least according to its website. See below exerts from the BCSC itself. The BCSC cannot properly fulfill this mandate to ensure a fair marketplace while these conflicts of interest exist. Nor can the BCSC adhere to the Taxpayer Accountability Principles it claims that it cares about. Its time for a full scale investigation into every aspect of the BCSC and how it conducts its ‘business’.Thank you very much for your time on this matter, you may contact me with any questions or for more info. Previous Previous post: UPDATE: CBC DOES HUGE STORY ON THE ADVISOR/ADVISER FIASCO THE REGULATORS IGNORE! Next Next post: DOES BCSC’S C. PAIGE LEGGAT THINK SHE’S THE BOSS DURING SETTLEMENT NEGOTIATIONS?